BACKGROUND: The informal economy in South Africa provides employment to large numbers of people who would otherwise have no opportunity to earn a living. Yet informal activities, such as day labouring, generate highly uncertain returns. Although it seems reasonable to conclude that day labourers would be dissatisfied with their lives, this is not necessarily the case as several factors contribute to people's subjective well-being. AIM: This study is in response to a call for more research on the subjective well-being of marginalised groups in South Africa's informal labour market. METHODS: Using Sen's Capability Approach, the study builds on earlier research conducted on the general well-being of day labourers in South Africa, with specific focus on their subjective well-being and geographical location. 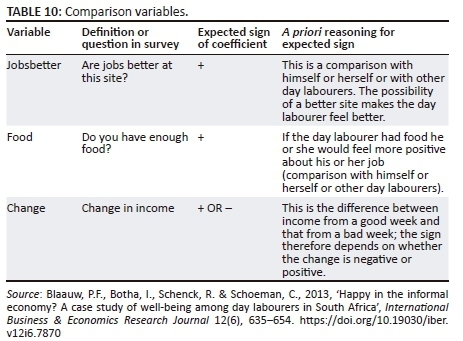 The results from a countrywide survey of 3830 day labourers were used in a regression analysis to compare the subjective well-being among day labourers across the nine provinces of South Africa. CONCLUSIONS: Although they have to operate in harsh conditions, day labourers in South Africa display agency by choosing to migrate to richer provinces in search of greater economic opportunity and reward. However, these potential gains are often negated by increased levels of competition and thus depressed wage levels. How to nurture marginalised groups' abilities to exercise agency and take more control of their lives represents fertile ground for researchers in future. It is commonly believed that people who are unable to find employment in the formal sector and need to fall back on low-skilled, informal work like day labouring and waste picking experience both financial and emotional deprivation. While the financial returns from these informal activities are often uncertain or inadequate, it should not be a foregone conclusion that the people performing this type of work are unhappy. There are a number of factors, other than straight earning power, that can possibly contribute to their relative satisfaction with life or their 'subjective well-being'. Subjective well-being (SWB), together with the factors contributing to the phenomenon, constitutes a highly complex field of study. Diener, Oishi and Lucas (2002:63) broadly define subjective well-being as 'a person's cognitive and affective evaluations of his or her life'. The cognitive dimension relates to a person's views about their life in general as well as particular aspects of their life, such as work and personal relationships. Ebrahim, Botha and Snowball (2013) and Hirata (2011) consider the relationship between happiness and absolute income to be one of the most important topics covered in the literature. Biswas-Diener and Diener (2001) expected people living in abject poverty in the slums of Calcutta (India) to be 'miserable'. Surprisingly, the authors found people with relatively high levels of subjective well-being, in spite of their impoverishment. Blaauw et al. (2015) were similarly surprised to find that the majority of the participants in their study on landfill waste pickers in South Africa's Free State province were not filled with despair - which would have equated with low levels of subjective well-being. The study outlined in this paper expands on previous research by Blaauw et al. (2013) (which looked at well-being in a general sense) by focusing specifically on the subjective well-being of day labourers and by introducing a new dimension: day labourers' geographical location, which is influenced by migration patterns. Migration and geographical differences are important considerations in a study of subjective well-being as they reflect day labourers' willingness to move from poorer to richer provinces in pursuit of greater economic opportunity and choice. Within this construct we used Sen's Capability Approach (CA) to contextualise day labourers' ability (or inability) to fully realise their potential and to achieve a satisfying existence. In line with the suggestion of Alatartseva and Barysheva (2015:37), we specifically measured day labourers' material well-being in terms of the level and stability of income and other relevant indicators. Personal income, we argue, is especially important for subjective well-being among poor people (Cummins 2000; Diener et al. 1993). The results from the first (and up until now only) countrywide survey of day labourers in South Africa were used as the basis for the study. The paper uses the Diener et al. (2002) definition of subjective well-being as the point of departure and then focuses specifically on the paradigm posed by Alatartseva and Barysheva (2015), which distinguishes between subjective and objective well-being. Whereas objective well-being uses quantifiable measures to determine a person's quality of life or well-being (such as access to water, electricity, education, and so on), subjective well-being relates to a person's own perceptions of their life. The rest of the paper is structured as follows. The next section examines Sen's Capability Approach, which provides the theoretical framework for the discussion. Subsequent sections provide a brief overview of the literature on day labouring and subjective well-being in South Africa, the survey methodology and results, the model selection and empirical analysis, the key conclusions, and avenues for further research. 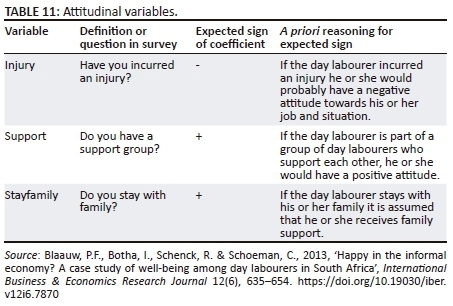 Sen's (1999) Capability Approach (CA) was used in this study as the theoretical framework to assess the subjective well-being of day labourers in South Africa. Robeyns (2006) views the CA as a normative framework for evaluating and assessing the opportunities, freedoms and capabilities of people to make choices and live valuable lives, which then contributes to their well-being. This includes aspirations to be nourished, to be literate, to have shelter, and to experience good health, self-respect and dignity (Alkire & Deneulin 2002; Robeyns 2005). According to Sen (1999), the freedom to lead different types of life is reflected in a person's capability set, which depends on factors such as educational level, health status and community involvement. An important component in a person's capability set is 'agency', which is the ability to pursue and realise one's own goals. The activity of day labouring is an example of agency in action. Faced with the opportunity and freedom to do so, day labourers choose to stand on street corners every day, often having migrated from other provinces and leaving their families behind. Sen (1999) explains that being free to make choices may be directly conducive to well-being. Although the income earned by day labourers places them in the survivalist category (Blaauw, Louw & Schenck 2006), the freedom to choose how and where they work might provide them with a sense of achievement. This phenomenon will be explored more fully in this paper in the context of day labourers' choice of geographical location and the impact thereof on subjective well-being. The economics literature provides a number of excellent reviews on the general determinants of well-being.1 However, literature on the subjective well-being of informally employed people in the labour market is much more meagre - both generally and in relation to South Africa. Blaauw et al. 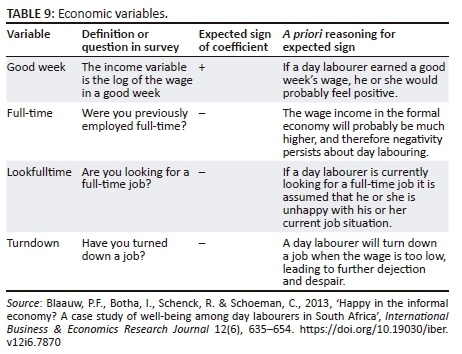 (2013) conducted an exploratory study on the possible determinants of subjective well-being among South Africa's informally employed, using day labouring as a case study. The results from this study corroborated the importance of employment and income for both the objective and subjective well-being of those living in abject poverty (Blaauw et al. 2013). However, changes in income and the quality of jobs are also tied to the location of the hiring sites within an urban or rural context. Large urban areas are located in those provinces where economic activity is more intensive. Differences in the levels of economic activity and growth as well as income differentials between the various provinces are a driving force behind the internal migration of day labourers in South Africa. Recent findings by Statistics South Africa (2014:31) give impetus to this deduction. In 2006, the highest levels of poverty were found in Limpopo (74.4%), followed closely by the Eastern Cape (69.5%) and KwaZulu-Natal (69.1%). By contrast, poor people were in the minority in the Western Cape (36.9%) and Gauteng (32.4%) (Statistics South Africa 2014:31). It therefore comes as no surprise that the majority of the day labourers in the Western Cape at the time of the survey were from the Eastern Cape. The question is, where do day labourers stand, especially given the precarious market conditions under which they operate? Available data suggest that day labourers, similar to other urban migrants, come to the wealthier provinces to find work. However, high levels of competition could result in many people's expectations exceeding their actual ability to achieve a better life. Therefore, disappointment might set in and erode their subjective well-being. Another study that dealt with the impact of geographical location on subjective well-being among migrants was that of Knight and Gunatilaka (2008). The authors set out to explain why the mean happiness score of rural-to-urban migrants in China is lower than that of those who stay behind in the countryside. They postulated that the aspirations of migrants rise when they get to the cities, but then their achievements fall short of expectations. South Africa has also experienced significant rural-to-urban migration, with many day labourers in urban areas having originated in South Africa's rural districts (Harmse et al. 2009). 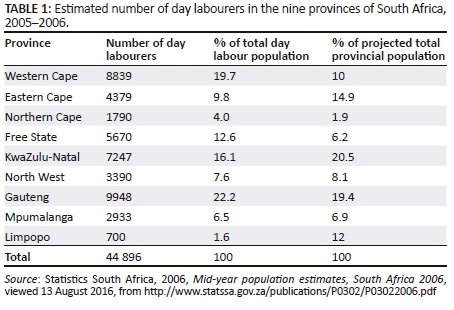 Table 1 provides a summary of the estimated number of day labourers in the nine provinces in South Africa during the 2005-2006 research and counting process, compared with the provincial population distribution at the time. 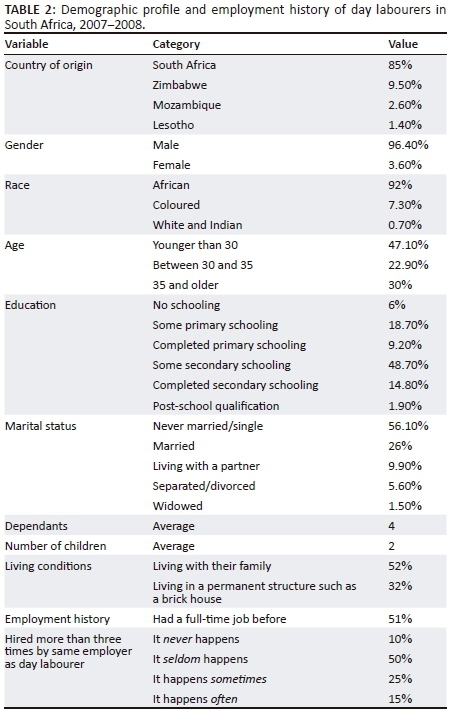 The survey results for gender and age of the day labourers reflect the racial composition of the broader informal sector in South Africa (Saunders 2005). Notably, the age distribution highlights the persistent unemployment and under-employment among the country's youth (Statistics South Africa 2015). In addition, each day labourer supported an average of four people, excluding themselves. At least 170 000 people survived on the income generated through this type of informal employment. A key element in the study of subjective well-being among day labourers is the income that they earn (Blaauw et al. 2013). 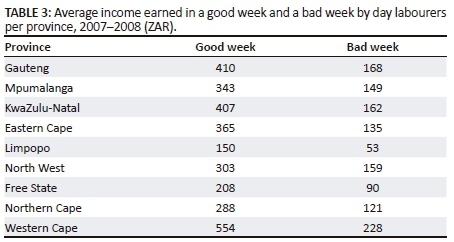 Table 3 shows the average income earned by survey participants in a 'good week' and 'bad week' respectively, across the different provinces. yi is the dependent variable for a certain cross-section (i); D is the subgroup in the cross-section - in this case, a province - and β is a k × 1 vector of parameters to be estimated on the k × 1 observations of the explanatory variables (X); i is 1,…N (Brooks 2008). As a robustness check, we also estimated a cross-sectional panel model. The results corroborated our findings. However, given that t = 1 in the panel analysis, we only report on the cross-sectional analysis in the ensuing paragraphs. The two dependent variables were the 'Best wage' and 'Good or better expectations', respectively. The highest mean best wage was in the Western Cape, followed by KwaZulu-Natal and Gauteng. 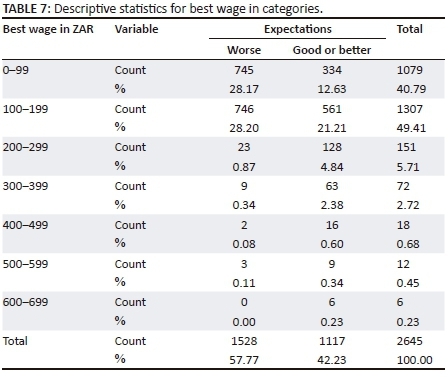 The maximum best wages recorded were in KwaZulu-Natal, Gauteng and Limpopo. The lowest mean best wage was in the Free State. There was high dispersion in the data, as revealed in the large differences between the minimum and maximum best wages per province as well as the high kurtosis values. The basic demographic variables are standard throughout the literature. They include gender, education, marital status and age. In this survey, age was categorised and was not used as a continuous variable. See Tables 8-11 below. 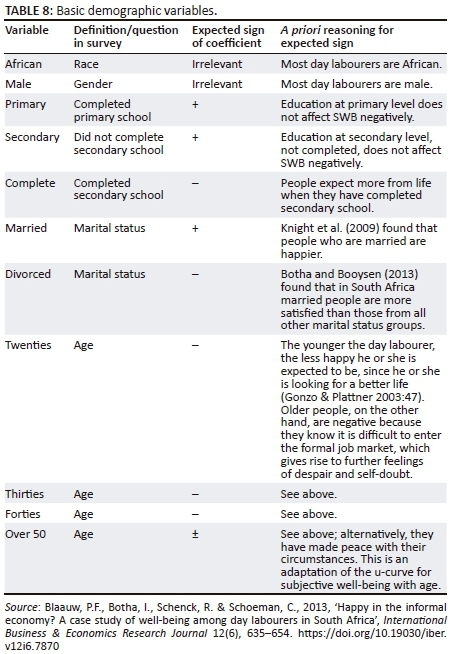 Most demographic variables were significant in the 2SLS model, which estimated objective well-being across South Africa. The twenties age group was significant. The education variables were significant with an unexpected sign for completed secondary school. The economic variables were all significant and the signs were according to expectations, except for previously having a full-time job which recorded a positive sign. Possibly, former full-time workers were more confident of their future prospects at the time of being interviewed as opposed to being dejected or angry about losing their employment status. Only the job opportunity and food variables were significant for the comparison variables - the signs were unexpected. For example, having enough food might reduce the opportunity cost of not standing on the street corner for days on end, leading to less employment and income. This might well be a cyclical and therefore non-linear relationship which needs to be tested in future research. The attitudinal variables were all significant, except for staying with family. The objective function was mainly driven by the tangible aspects of day labouring, such as staying with family, injuries occurring and being part of a support group, while the dependent variable was the actual income. The subjective function was mainly driven by comparison variables, including whether there were better job opportunities at the site, whether day labourers had enough food and changes in income. These variables were based more on perceptions and the function's dependent variable was based on income expectations. The community variables and the dummy variables for the provinces were significant in both functions. The objective function's coefficients were positive and indicated that the provinces differed in terms of income (Knight et al. 2009). 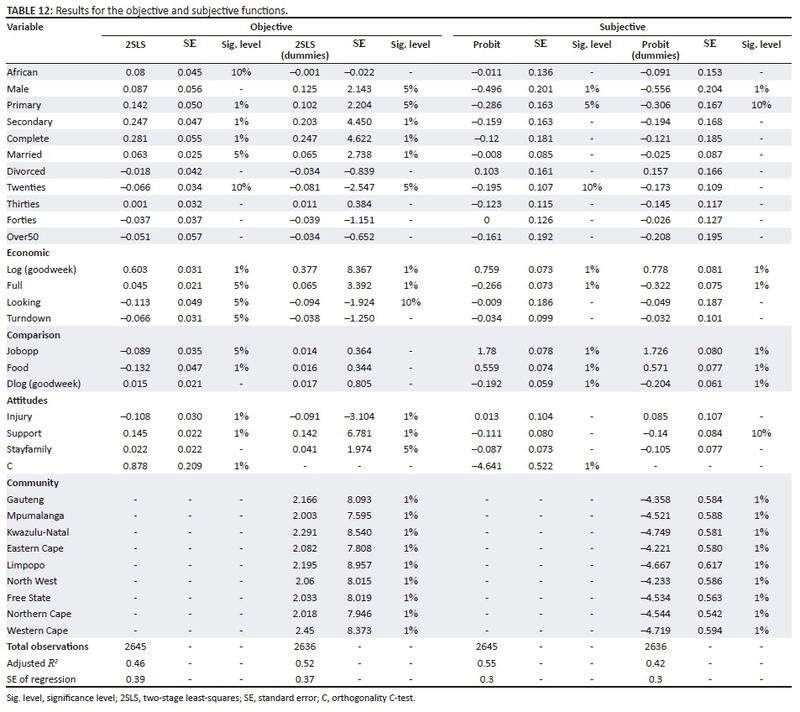 The subjective function's coefficients were negative, showing that perceptions of well-being had a negative impact on subjective well-being - which was in contrast to the positive impact on well-being in the objective function. This possibly also explained the different signs for the full-time job variable in the two functions. This is because the perception of a full-time job was negatively perceived in terms of subjective well-being, in contrast to the positive sign in the objective function, which was linked to a certain income rather than the perception. Mulcahy and Kollamparambil (2016) found that rural-to-urban migration has a negative impact on subjective well-being in South Africa due to unmet expectations and aspirations, and emotional fallout. For day labourers in South Africa, this may also be the case. The richer provinces have more job opportunities but also more competition, and therefore the income may not be as good as day labourers expect. This is supported by the evidence presented in a study by Krugell and Blaauw (2011): in metropolitan areas, greater occupation density was negatively associated with the earnings of day labourers, which reflected the competition for jobs among day labourers in the big cities. A general increase in the number of day labourers in South Africa's major cities since the global economic downturn and slower growth in the construction industry have given rise to even greater competition. The findings also confirmed that geographical links and community variables are significant in both functions, indicating that well-being is statistically different between the provinces. This seems a plausible result, given that migration to provinces that are doing better economically can potentially add to the freedom and capabilities enjoyed by day labourers. To reiterate, it is the agency that day labourers display in leaving family and familiar surroundings behind in search of better opportunities that makes such benefits possible. However, on a subjective level, these potential gains are to a large extent negated by increased levels of competition and an oversupply of day labourers in most urban labour markets. This often leaves day labourers disappointed with the returns from their 'agency investment', so to speak. On a methodological level, the results open up new avenues for refining the study of subjective well-being as it relates to the informal economy. The question arising from the application of Sen's CA is the extent to which it is not the income per se that influences the level of subjective well-being but rather what people can afford with the income and the welfare difference they feel afterwards (such as freedom from hunger and other forms of marginalisation) that determine their levels of subjective well-being. Although the literature supports income as a measure of objective well-being, it cannot speak to the capabilities, functionings and freedoms it brings. Measuring the dimensions of subjective well-being is the methodological challenge for future research flowing from this study. Well-being in the informal economy is a multifaceted phenomenon. It is imperative to use both the objective and subjective measures of well-being when dealing with well-being among day labourers and, by implication, other marginalised groups. For many vulnerable groups such as day labourers, waste pickers and car guards, the informal economy offers both opportunities and certain freedoms to the unemployed. Even with limited capabilities, these people are able to access work and income through some form of agency. This offers them at least some self-respect and provides an alternative to a life of begging or, worse, crime. A day labourer in Port Elizabeth summed it up very well: 'We cannot sit at home and watch the hungry family'. 1 . See, for example, the work of Frey and Stutzer (2002) and Dolan, Peasgood and White (2008). 2 . Given the length restrictions for this paper, see Blaauw (2010) for a detailed discussion on the choice of day and seasonal considerations and other operational arrangements. 3 . See Harmse et al. (2009) for all the locations at municipal level. 4 . Although this makes the data set 10 years old, it still remains the only data available. Furthermore, the extent of day labouring is expanding continuously, making it important to utilise the available data while the follow-up survey is currently being conducted.